We invite you to learn more about the Montessori Method and about our infant/toddler classes by browsing through the sections below. In Montessori, infant/toddler consists of ages birth to three (3) years. The children in these different age groups spend time apart from each other as well as periods of time with each other. The infant/toddler class helps children grow through the sensitive period. At Liberty Montessori, we welcome infants from six (6) weeks to approximately 12 months, depending on development, into our Dragonfly lower nursery. Not all Montessori schools offer this program. Our focus on the infant is to provide care and support during their growth period. Our primary goal with an infant is to develop language. We, as teachers, use language to not only talk to them, but also to explain what we are doing (this happens during diaper changes and feeding). We will tell them that we are changing their diapers; it’s time to eat, etc. This not only teaches the children how to communicate, but teaches that we respect them. It prepares a child for a change that is coming so that they will have a better transition. We carefully lay out an infant space for the developing child. Lots of floor space provides the infants room to move and play on the floor; having a mix of hard and soft surfaces provides an infant time to learn how to navigate spaces and learn to protect their body. 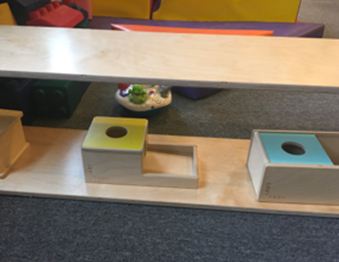 The materials inside the classroom provide enrichment through all the senses. We carefully evaluate things that we place out as to their benefit and safety. 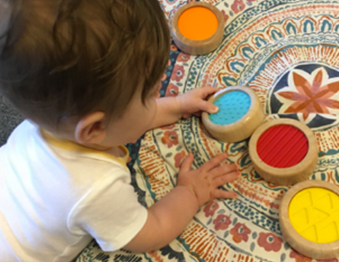 These materials are things that infants can use by themselves or with others. Teachers provide the guidance with the materials as they place them on the shelf for the first time. 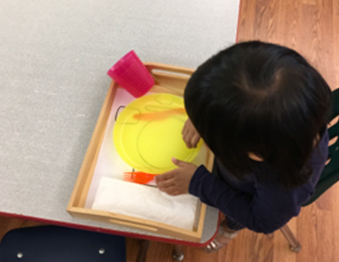 Montessori infant/toddler programs are designed for children 12-18 months of age (depending on development) through two and a half (2.5) to three (3) years (depending on development). Liberty Montessori has adopted this very authentic Montessorian approach to guiding infant/toddlers. The older infants (12-24 months) spend time with other children who are similar in age as well as with the toddlers. 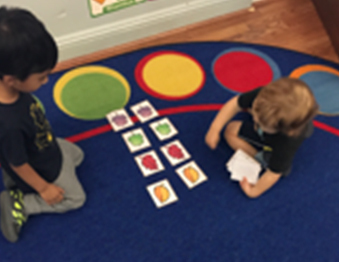 After consulting with the credentialing bodies, American Montessori Society and AMI as well as the teacher education programs, including Westside Montessori Teacher Education, Liberty Montessori has one classroom for its infant/toddler class. Your children spend time grouped together and apart. Spending time together gives toddlers room to take a leadership role with the smaller ones. Montessori said about mixing ages, “All the older ones become heroes and teachers, and the tinies are their admirers.” (Montessori, p. 226, Absorbent Mind). Toddlers need order in their environment because everything to them is chaotic. Having a stable, predictable schedule, along with minimal choices, helps a child grow and flourish without losing their sense of self. They also need help learning inner order. This inner order sometimes unfolds as what would look like a tantrum or an odd demand, but really, to a child it makes sense. A child who always uses an orange cup at lunch every day will throw a tantrum when you give them the green cup one day. To an adult, we see this as an odd demand or would not even think twice about it. To a child though, this order is what helps them get through the day. By the end of the school year, the teacher is able to sit back more and watch the children take a more direct role in the classroom. They have learned the routines, how materials are used, and how to be a leader among their peers. Independence is a big part of not only Montessori education, but also a big part of a child’s development. Independence gives a child confidence to go through life as well as school. In the world today, so many children are growing up unsure and unconfident in the world around them, often because the adults in their lives do everything for them. While many adults don’t see this, it hinders a child’s development in many aspects. Children who do not learn to do for themselves, will not know what things they like nor will they know how to navigate the most simple tasks being presented to them. For children who are not encouraged to be independent, making a simple decision can provoke severe anxiety. Helping a child learn that they can do things on their own will help them learn to navigate and problem-solve. This encourages critical thinking, positive emotions, and positive self-esteem. This early problem solving provides the tools they can take and use throughout their life. The sensitive periods occur during the first three (3) years of life for a child. During this time, a child grows and learns at a remarkably fast pace. They are constantly absorbing and filing things away to use later in the world. The first things that develop in a child are his/her senses as they begin to hear, see, touch, and smell so many different things. The child first will store this away so that they can sort it out as they get older. The first year of life holds a lot of firsts for a child (words, steps, etc.) that help a child gain a footing in the world. Enrollment in Liberty Montessori ensures that your child is challenged in developmentally appropriate ways. The second year into the third year consists of a language boom. A child has better control of their body and can now put the effort into more meaningful and productive tasks for themselves. During the sensitive period, children are also learning how to control their feelings and emotions. Adults often call these tantrums. Instead, what is happening is that a child has a turmoil in their life they cannot grasp or sort out. This may be feelings or even something in their environment. A child is looking for guidance from an adult to help them sort out what is happening inside them and looks for someone to give them a way to express these needs in a healthy manner. When your child is ready to leave the nursery and move to the next class, we will hold a meeting to discuss this move. We will have these discussions during parent/teacher conferences. Would you like to learn more? Call us for an appointment at (201) 987.8745.